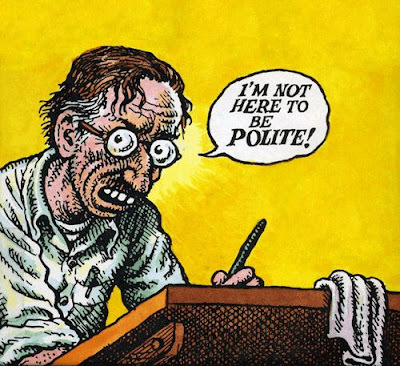 Stephen W. Terrell's (MUSIC) Web Log: WACKY WEDNESDAY: Another Birthday for R. Crumb! WACKY WEDNESDAY: Another Birthday for R. Crumb! Once again it's birthday time for America's greatest cartoonist Robert Crumb. The old boy turns 74 today. 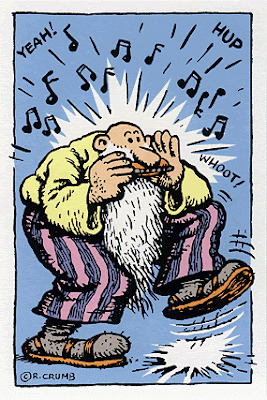 As most of you know, in addition to his talents as a visual artist, Crumb also is a musician. His main love is old 1920s-30s jazz and blues. With his string band The Cheap Suit Serenaders, which first came together in San Francisco in the late '60s, Crumb captured the crazy energy of those old sounds -- which also informed his vision behind his best cartoons. So happy birthday one more time, Mr. Crumb and many more. Here are a bunch of his songs on YouTube. This one is called "I Had But 50 Cents." Regular readers know I love the following song, "I'll See You in My Dreams" (See HERE and HERE.) Crumb and the boys do it justice. This is about a girl who lives down by the firehouse. This is a crazy little instrumental called "The Cuckoo Waltz." Enjoy the visuals. THROWBACK THURSDAY: Happy Birthday Smithsonian!